Is Prometheus really that bad? Ridley Scott’s loose prequel to Alien digs an enormous hole and subsequently fills it with even grander musings; of humankind, creation, belief and life. It then plunges nose first into said crater, now as deep as the questions posed, before admirably clambering back to fresh air armed with purpose and answers. During this ascension we marvel at spectacle, engage in mystery, taste small bites of action, are disconcerted by horror and ponder classic science-fiction. To a certain extent Prometheus truly is a genre-splicer, but the outing always has its reels firmly planted in the wonders of sci-fi, exactly where they should be. In an era when summer often denotes the arrival of popcorn-churners, Prometheus survives on the front-line, waving the flag for intelligent and thought-provoking cinema. Elizabeth Shaw (Noomi Rapace) and Charlie Holloway (Logan Marshall-Green) are archaeologists on the brink of silencing the most emphatic of all historical debates: who created us? The year is 2093 and a team of seventeen personnel including Elizabeth and Charlie have just landed on LV-233, a moon prominent in a number of ancient diagrams discovered by the duo. Aboard their vessel funded by Weyland Corporation is David (Michael Fassbender), a robot whose appearance resembles that of a human being, and whose thought process is occupied exclusively by sense. The landscape that enshrouds the team bustles with unknown activity, enticing the crew’s inbuilt need to forage, which they do unwittingly and at their own peril. Zipping up his spacesuit, David is confronted by Charlie who queries the need for the machine to dawn such protective attire. “I was designed like this because you people are more comfortable interacting with your own kind. If I didn’t wear a suit, it would defeat the purpose,” retorts David, summing up the philosophy of Prometheus in a single answer. The crew are on a voyage to meet their maker, but in doing so unknowingly present a case denouncing the ignorance of humanity. Collectively, we see ourselves as the pinnacle species yet we are wholly unjustified in our complacency. Damon Lindelof’s script explores how we not only rely on other genetic divisions — plants for medicine, animals for food, machines for everyday ease, Gods for belief — we even mistreat them. Humanity’s naive demeanour is reflected in Charlie’s actions: he howls like a domineering wolf upon reaching a huge stone dome situated atop the uncharted moon, and proceeds to remove his helmet without approval, seemingly above any potential atmospheric ramifications. The film is an eye-opening critical analysis of human behaviour and although the results stop short at shining a positive light on us, they do beckon forth an important topic of discussion. David’s response also reflects the insightfulness and opulence of Lindelof’s script, one that is not afraid enter to a room packed full of grandiose ideas, and is then brave enough to exit whilst leaving the door ajar. The occasional question is left unanswered which is absolutely fine (but we need some answerable continuity in the upcoming sequel). No issue remains unchallenged though, much to the filmmakers’ credit. Scenes prompted by deliberations over the various characters’ motives and beliefs are subtly tantalising; one involving David, Charlie and a snooker table particularly stands out. These moments never overstay their welcome as they flirt with extravagant perceptions that are inherently connected to the science-fiction genre. Entering said realm we expect to contemplate life, the universe and everything and Prometheus encourages us to do exactly that. (“Where do we come from? What is our purpose? What happens to us when we die?”) Thankfully events refrain from boiling over into an indulgent territory; the aforementioned questions — unending in scale — are questions that cross our mind often and the significant consideration on show is warranted. 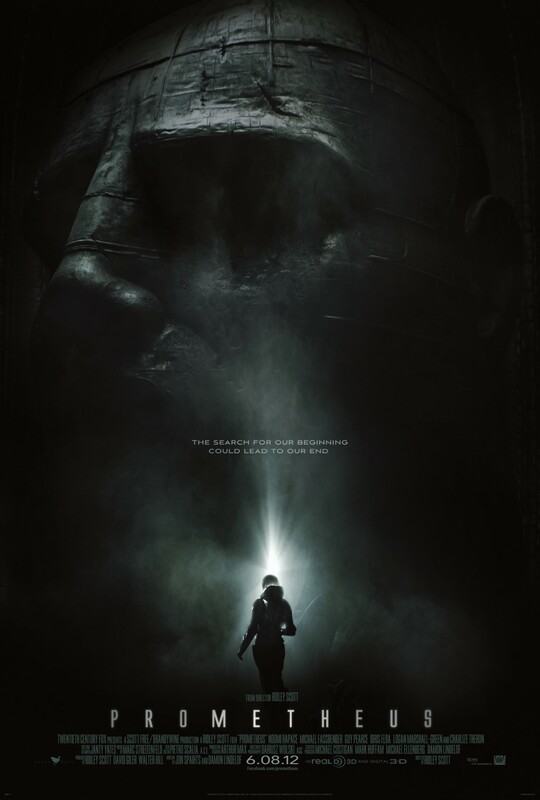 Reflective themes in the bank, Prometheus turns towards tension-ratcheting atmospherics. Alien is in part a horror franchise, there it is imperative that Scott’s prequel retains prequel retains an element of fear to complement the titbits of recognisable Xenomorph mythology on display. Marc Streitenfeld’s jarring soundscape is the genesis of discomfort; sequences that take place inside the aforementioned dome are accompanied by a chilling congregation of distant screaming. This eerie ambience disorientates us. The characters panic. A search buoyed by ambitious questions seeking conclusive answers yields unsettling possibilities. Never has the notion of being stranded in space upon an unknown entity felt so terrifying. Then brass horns prevail, baring a deep verve that reflects the profundity of proceedings. The film’s stunning visual scale is just that, and its impressive execution qualms any potential worries over digital misfiring. Space vessels flow effortlessly, emitting a sense of authenticity as they embed into the landscape. At times, Prometheus’ sheen resembles that of Nicolas Winding Refn’s psychedelic Valhalla Rising; shots of unnaturally rapidly convulsing clouds remind us that we are in a foreign and undoubtedly hazardous environment. The weather too, another reminder that humankind is not the dominant species. One element that doesn’t quite acclimatise is the occasional spouting of humour. Some may argue that without a light-hearted adage every now and again, the film would be taking itself too seriously. However, the ideas being batted back and forth along the outing’s grand narrative arc warrant a serious tone. Fifield and Millburn — geologist and biologist respectively — are the stock comic relief duo and though Sean Harris and Rafe Spall are solid in their roles, the characters are wholly unnecessary. In truth, the duo’s presence on the ship doesn’t really make sense — they’re buffoons, why would a multi-million dollar corporation hire them? If humour prevails at any point, it’s through Idris Elba’s suave poise and effortlessly blunt attitude as captain Janek. There are no disastrous performances here by any means, nor are there any bad ones, but Michael Fassbender stands streets ahead of everyone else. One of two surprisingly ambiguous characters (the other being Charlize Theron’s practical Meredith Vickers, whose ethical mindset rides on a Ferris wheel throughout) Fassbender resonates a peculiar charm as robot David, whilst instantaneously channelling the nonchalant precision of HAL 9000 from 2001: A Space Odyssey. Much like HAL, David’s actions take an increasingly perturbed turn; the combination of Fassbender’s astute portrayal and Lindelof’s creation of an opaque character adds up to compelling viewing. Noomi Rapace is another noteworthy performer as expedition leader Elizabeth Shaw. Her pained abdominal acting will have you grasping your stomach and wincing. This dialogue-driven piece demands total engagement for just over two hours and justifies the attention it seeks. There’s a mountain of ideas here to sink your teeth into and, trust me, your jaw won’t ache. Scott’s film is a modern cinematic gem. Is Prometheus really that bad? No, it’s really that good. Should have been so much better. Not just because of the director and the cast, but because of how great it looked from the advertising and the fact that it’s somehow related to Aliens. Whatta shame. Good review. See, when this came out in 2012 I went into it having never seen any of the Alien films, which I presume was a huge factor in my enjoyment back then. In other words, I had no preconceived expectations stemming from Alien. I have now seen Alien/Aliens though, and still hold Prometheus in such a high regard, haha. Cheers Dan! I hope you enjoy it mate, I think it works both as a stand-alone film (for those who aren’t well-versed in the Alien franchise) and a prequel. Thanks Tom! No argument from me! A sublime film and a terrific addition to the Alien universe. The streak continues ;). Brilliant, glad to hear to it Joseph! I definitely agree that some of the characters are unnecessarily stupid, but also feel that the likes of David and Elizabeth are strong. Hopefully the sequel will offer more robustness in that area though. Appreciate it Mikey! Great work Adam. Personally, I didn’t take much from this when I first seen it. I was very disappointed. It’s one I’ll have to sit down with again, though. I hadn’t seen any of the Alien films when I watched this back in 2012, so perhaps that’s why I have more of an affinity towards it – my expectations weren’t born out of any Alien-esque hopes. Give it another shot if you get the chance Mark. Thanks mate! Wow, that’s quite the praise Adam! Can’t say I was as positive as you about it. It did some good stuff but I just felt Ridley was trying to shoehorn the Alien franchise into a completely different film just to make some money. Didn’t really work for me, but it may well work better when put together with its upcoming sequel(s). Great review mate. For me it works as a stand-alone piece as well as a loose prequel, but I reckon that’s because I hadn’t seen any of the Alien films before watching this in 2012 and therefore didn’t know what to expect. 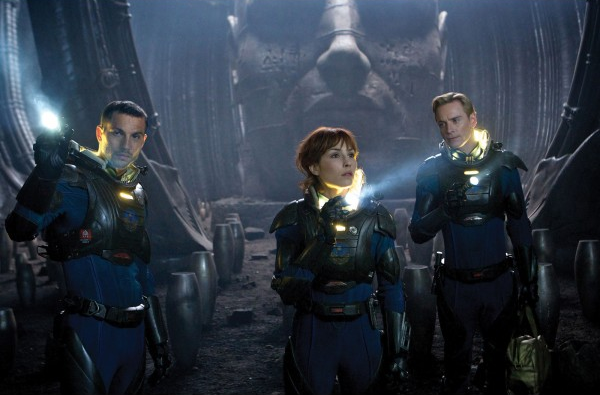 I do love that Prometheus is such a divisive film though – the essence of cinema! Thanks Chris! I’ll admit that this is a good movie but they totally fooled us all with the marketing campaign. This looked like it was going to be balls out, teeth grinding scary and it was simply a Sci-Fi drama. Good – but not what we were lead to believe. I’ll give you that Eric! Damn adverts, ruining all the fun! Haha, thanks man. Great review, thanks for sharing all this.. Thanks for reading, appreciate it! I’m with you all the way! I thought it was fantastic 🙂 Visually stunning, the story was great, and I just felt everything went great together! Brilliant! It certainly meshes well, and each component is of a high standard – wonderful concoction. Thanks for stopping by Kim! So glad to read a positive review of the movie. I agree Fassbander was great but for me the best performance here was Rapace, she is actually my best actress win for this performance. She didn’t try to copy Weaver and managed to create another strong heroine in Alien franchise. Rapace is excellent, you’re absolutely right. Great point about not copying Weaver either, an approach that would’ve been layered with pitfalls. Thanks for reading! I’m a huge admirer of Prometheus. Just think there’s so much going on under the surface. We can start a club, haha!